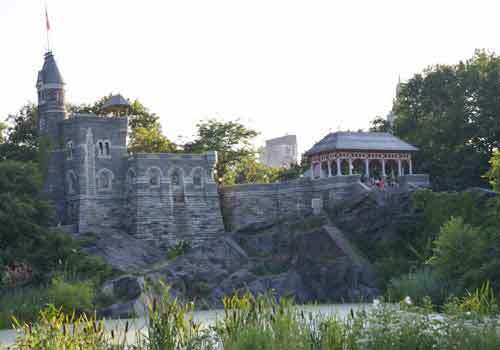 Whether approaching Belvedere Castle from the southern edge of Turtle Pond, through Shakespeare Garden or the narrow paths leading from the Ramble, parkgoers will climb the slopes of Vista Rock - the highest point in Central Park. A massive outcropping of schist created hundreds of millions of years ago, Frederick Law Olmsted and Calvert Vaux saw the bedrock as the perfect site for the whimsical castle. The National Weather Service also considered it a prime spot. Since 1919, temperature and wind speeds have been recorded from the castle’s high perch on Vista Rock. Today, Belvedere provides the best and highest views of the Park and its cityscape. In fact, 'belvedere' is an architectural term for lookouts and observatories that, in Italian, translates to "beautiful view." Mid-Park at 79th Street at Belvedere Castle.